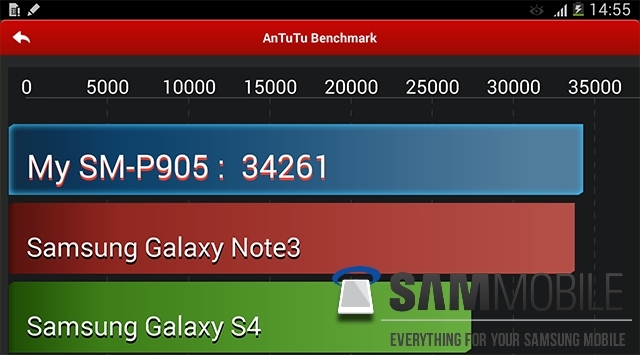 Details on the specs and the benchmark performance of the yet to be announced Samsung Galaxy Note Pro 12.2 have emerged. The top-end tablet is tipped for a MWC 2014 release in Wi-Fi-only and LTE flavors. The Wi-Fi version of the upcoming tablet will sport the model number SM-P900, while the LTE variant will be known as SM-P905. The model numbers fall in line with previous reports which pointed at an AT&T version of the slate with a model number SM-P907A. As the name suggests, the biggest highlight of the Samsung Galaxy Note Pro 12.2 will be its display. It is a 12.2” unit with WQXGA resolution (2560 x 1600 pixels) and 16:10 aspect ratio. Coupled with an S Pen, the large screen is bound to make the slate a serious productivity tool. Rumored specs of the SM-P905 include Qualcomm Snapdragon 800 8974-AA SoC with 2.3GHz quad-core CPU, Adreno 330 GPU, 3GB of RAM, 8MP main camera, and 2.1MP front-facing unit. Along with LTE, connectivity options of the SM-P905 include Wi-Fi 802.11ac/a/b/g/n, NFC, Bluetooth 4.0, and IR blaster. There is no word on the exact specs of the Wi-Fi only version. We will not be surprised to see it tote an Exynos chipset. The Samsung Galaxy Note Pro 12.2 is said to boot Android 4.4.2 KitKat with TouchWiz UI. The latter is reportedly significantly revamped for better tablet experience. The Antutu score you see above is tipped to be from a device running experimental software. The final firmware will allegedly propel the tablet to a 40,000+ result in the popular benchmark. Samsung Galaxy Note Pro 12.2 is part of the Korean giant’s 2014 tablet market blitz. Samsung aims to sell 100 million tablets this year.